Alpha Hydrox has several affordable and good AHA exfoliation products. Alpha Hydrox AHA Enhanced Lotion contains 10% glycolic acid with pH 4. Fragrance free. For normal to dry skin. Alpha Hydrox Oil-Free Formula contains 10% glycolic adic with pH 4. It also contains green tea extract, sea kelp extract and vitamin B5. Fragrance free and oil free. For any skin type. DDF Glycolic 10% Exfoliating Moisturizer contains 10% glycolic acid with pH 3.6. Fragrance free. For normal to dry skin. DHC Renewing AHA Cream contains 10% lactic acid with pH 3.8. It also contains olive oil. Fragrance free. For normal to dry skin. Murad APS Night Reform Treatment contains 10% glycolic acid with pH 3.5. It also has several antioxidants and anti-irritants. Fragrance free. For all skin types. Murad Intensive Wrinkle Reducer For Eyes contains about 5% glycolic acid with pH 4. Generally, I do not recommend AHA products with this low percentage of glycolic acid with such a high pH but this milder version is more suitable for delicate eye areas. It also has several antioxidants and is fragrance free. OBAGI NU-DERM Exfoderm Forte, AM is a simple AHA exfoliation product containing 6% glycolic acid and 4% lactic acid with pH about 3.2 – 3.5. Fragrance free. For normal to dry skin not prone to blemishes. Peter Thomas Roth Glycolic Acid 10% Hydrating Gel contains 10% glycolic acid with pH 3.6. It also has aloe, vitamin E, retinyl palmitate, and vitamin C. Fragrance free. For all skin types. Peter Thomas Roth Glycolic Acid 10% Moisturizer contains 10% glycolic acid with pH 3.8. It also has aloe, vitamin E, and retinyl palmitate. Fragrance free. For normal to dry skin. 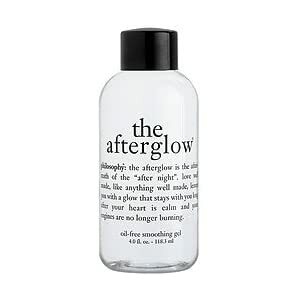 Philosophy the Afterglow Oil-Free Smoothing Gel has a very simple formula with pH 3.5. The percentage of lactic acid is unknown but I still recommend it because lactic acid is right after water on the ingredient list. Fragrance free. For all skin types.